BOOK YOUR FREE FIELD TRIP TODAY! To book a Free Field Trip for your group please click the button below to submit the online application, or download and complete the application form below. If you have additional questions please call Emma Fritz in the Museum Services Department at 405.523-3211, email to ef@oklahomahof.com. BOOK A FREE FIELD TRIP HERE! See the impact of the Gaylord-Pickens Museum experience! We understand the challenges in the educational environment today. The Oklahoma Hall of Fame offers FREE Field trips to students statewide and you can hear directly from teachers and students on the importance of these FREE educational opportunities. 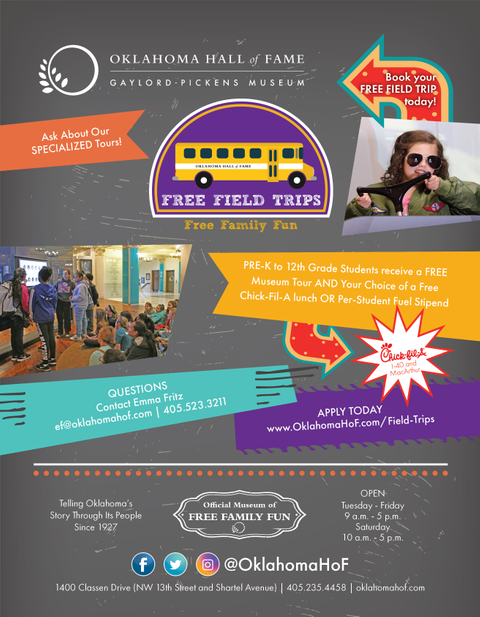 The Oklahoma Hall of Fame at the Gaylord-Pickens Museum is offering FREE FIELD TRIPS to students statewide throughout the Summer of 2019 and the 2018-2019 school year. *OERB Field Trips must be booked through the OERB Homeroom website. OERB fieldtrips include only the Fuel Stipend benefit. Free Field Trip spots are filled on a first-come, first-served basis. GROUP GUIDELINES To ensure the safety of our visitors and the proper care of the Museum and its exhibits, we ask that certain group guidelines be met. Any exceptions to the requirements below must be approved in writing prior to your field trip. Student groups must include a minimum of 10 students to qualify for the free field trip program. The following student/adult ratios are recommended. Grade 5 and below: 1 adult per 5 students Grades 6–12: 1 adult per 10 students Adult chaperones will receive complimentary admission. Thanks to program sponsors: Oklahoma Hall of Fame Teen Board! The Museum is closed on July 4th, Thanksgiving Day, Christmas Eve, Christmas Day and New Year’s Day. Free parking is available in the lot on the north side of the building. Buses and motor coaches should drop passengers off at the entrance to the Edith Kinney Gaylord Garden and park on the north end of the parking lot. Photography, video or tape recording in the exhibits is only allowed with special permission from the Oklahoma Hall of Fame's administrative staff. Please silence cell phones and devices to refrain from disturbing other guests’ museum experience. Outside food and drink, including gum, are prohibited, however, school groups may bring sack lunches to eat on-site if arrangements are made in advance.